"Corned Beef" is cured like ham and bacon. The term "corn" is an ancient English euphemism that refers to the seeds in the traditional cure. Beef short ribs, flanken cut, cured/corned, 2 lb/1 Kg. Parsley, fresh, chopped, 2 Tablespoons. Channel or chamber vacuum device–unnecessary if you use Ziploc freezer bags. Vacuum seal the ribs in single layers so that heat is evenly distributed. Because of their shape, care should be taken to make sure the pouches are not taller than the water line. Racks serve to separate each package of ribs. The water can then circulate freely between them. Lipavi containers can be filled in such a way that the lid comes in contact with the water in the vessel and self-seals around the rim. This saves heat and prevents pouches from floating or otherwise protruding from the surface of the water. 140 F/60 C for 60 hours. 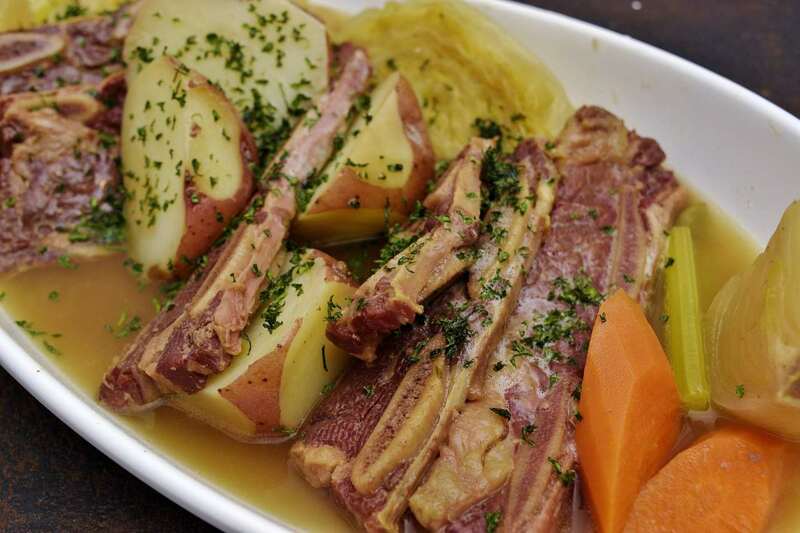 Once the short ribs have been processed, they are pasteurized/preserved. Submerge the unopened package(s) in iced water until 70 F/21 C is achieved–this usually takes about 30 minutes. Refrigerate the ribs at 40 F/4 C until the day of service–they will keep in the current state for at least a week. Do not be tempted to put the hot packages in the refrigerator! Not only will they spend too long in the temperature danger zone between 140 F and 40 F (60 C and 4 C), the heat from the pouches will compromise the safety of other foods in the vicinity. Sous vide serves the practitioner–not the other way around! There is no “moment” before which the ribs are not ready and after which they are overcooked. 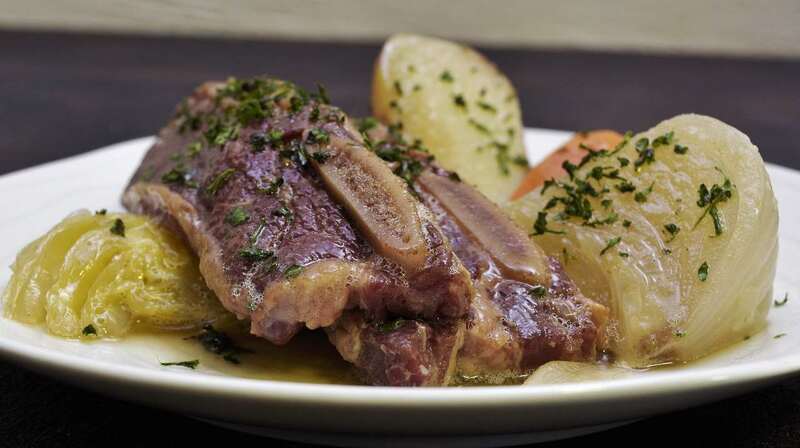 Once the necessary amount of collagen has been converted to gelatin, a package of flanken short ribs processed at 140 F/60 C for 66 hours will not be noticeably different than one that was processed for 54 hours. You do not have to calculate in advance just exactly what time the ribs must be started. Neither will you need to rush home from work in order to remove the bags from the bath. Let sous vide adjust to YOUR schedule! While the sous vide bath is heating, start the broth in a sauce pot by combining the 2 quarts/2 liters water with the spices listed in the ingredients section: kosher salt, celery stalk, carrots, onions, and the peppercorns, allspice, cinnamon, ginger, coriander, cloves, crushed chilies, garlic powder, nutmeg, mustard seed and bay leaf. Bring to a simmer on the stove, and allow to cook for 1 hour while you prepare the other vegetables. Remove the celery, carrots, and onions from the broth after the first hour, but the spices may remain. Prepare the vegetables: Cut the red potatoes in half. Cut the cabbage into wedges–leave the root end intact to hold the wedges together. Cut the celery stalk into fourths, peel and cut half of the carrot to approximately the same size as the celery. Add the rest of the carrot to the broth. Cut the stalk end off of the onion, leaving the root end intact. Cut the onion in 8 wedges. Carefully remove the peel from two of the wedges, allowing the root end to hold the wedges together. Add the remaining onion to the broth. Remove the flanken ribs from the bags and pat dry. Cut into lengths that each have two bones to better fit the plate. 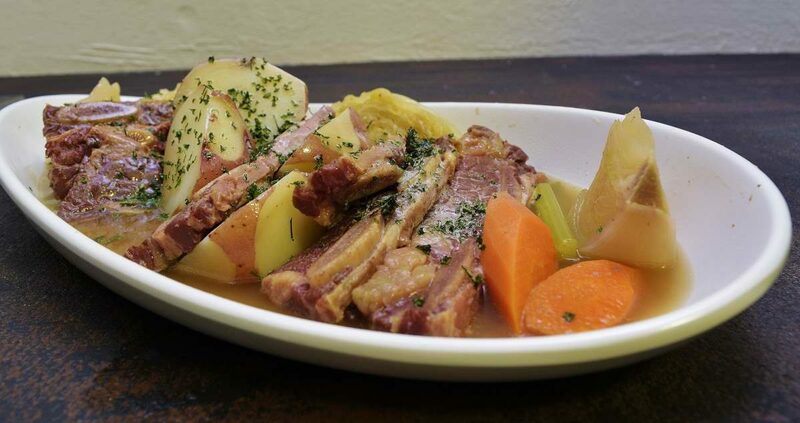 Combine the corned ribs, the carrots, celery, onions with 4 oz/100 ml of the broth in one bag. Note: the easiest way to incorporate liquids into the bag is by using Ziploc Freezer bags. Channel vacuums can perform the task if you are careful to seal the bag before the device starts to withdraw liquids past the sealing element. If this proves too difficult, omit the liquid in the bag and incorporate it later. Lower the pouch into the bath set to 183 F/84 C. Process, along with the pouch described below for one hour. After that interval has been achieved, lower the bath temperature to 128 F/53 C. In this state, the packages can be held for up to eight hours without compromising quality or safety. Seal the cabbage and potatoes with 4 oz/100 ml of the broth in another bag. Again–if you have difficulty sealing the bag with the liquid in it, just omit the liquid for the time being. Lower into the bath set to 183 F/84 C and process for one hour as explained above. Make sure the tank is completely full so that the lid can keep everything submerged even if the vegetables have a tendency to float. Carefully remove the pouches from the bath. Cut open the bags and stage the ingredients into a large, flat bowl. Arrange in an orderly fashion as shown below. Add some broth from the bags or from the pot. Melt the butter and drizzle it over the meat and vegetables. Sprinkle with the chopped parsley. 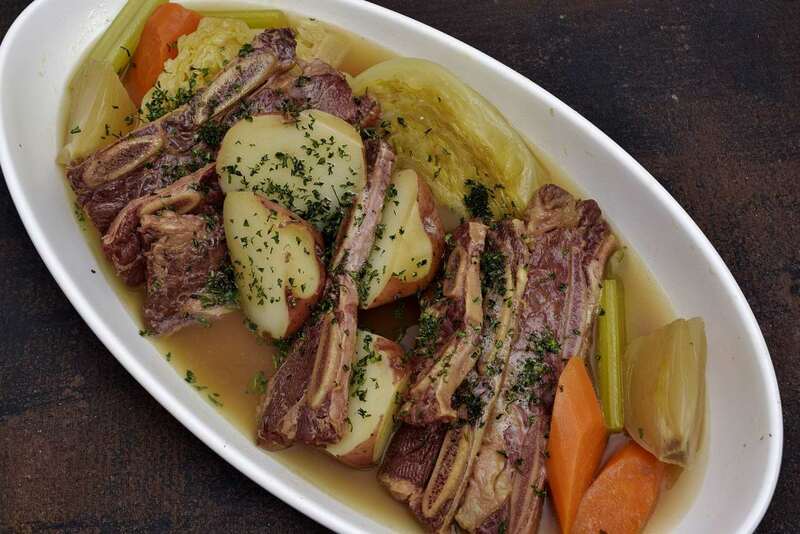 This dish is a crowd pleaser, and you need not wait for the Irish holiday to serve it to your family or even party guests! The flavor profile and splashing colors belie the overall simplicity of the dish. Most of your time is spent waiting, instead of perspiring over a hot stove and hoping that your corned beef is tender without falling apart. I love sous vide! This dish is much more common in the United States than in Ireland, and is practically unheard of in many countries. They don’t know what they’re missing! Corned beef usually utilizes beef brisket, but any tough cut of beef is suitable for "corning." The process uses kosher salt, sugar, and usually a nanoscopic amount of nitrites. There is a common misconception that nitrites are unhealthy and/or toxic to humans. Carefully measured, they are harmless in the nanoscopic amounts in which they are used. Nitrites greatly reduce the risk of spoilage and pathogenic infestation. With some reading, you can learn to cure beef at home, but any competent butcher/sausage maker should be able to accommodate you. 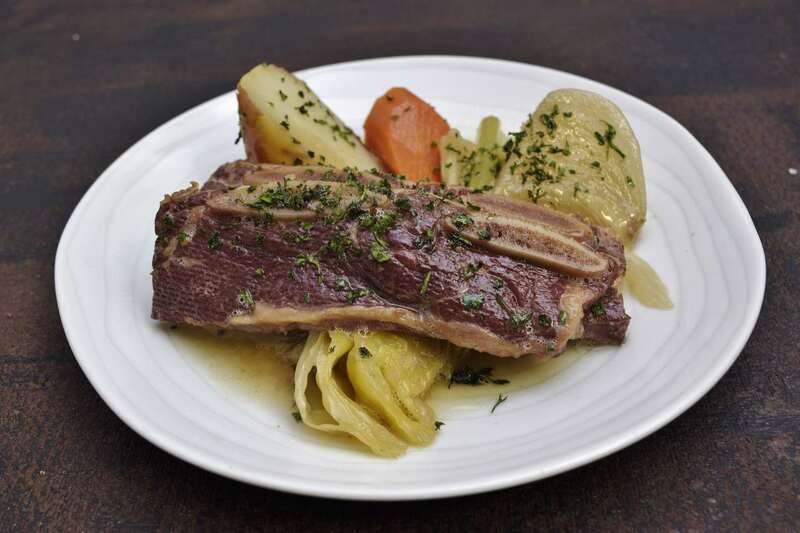 Except for the cut used, this recipe is evocative of the St. Patrick's Day specialty meal popular in the U.S.